In this episode, Emily interviews Jonathan Sun, a second-year PhD student at Yale University. Jonathan purchased a house in New Haven after his first year in graduate school. He shares the process he used to search for and ultimately go under contract on a home, including applying for various incentive programs. But his home ownership goal was nearly derailed; his original mortgage lender pulled out because his fellowship income isn’t reported on a W-2, and he had to scramble to find another lender at the last second. Jonathan Sun is a second year PhD student in Pathology at Yale University in New Haven, Connecticut. His stipend is $35,000 and it increases annually. When he moved to New Haven, he started by renting a two bedroom, one bathroom apartment with his girlfriend. He was paying about $1,500 monthly for rent. 3:10 What made you think that it would be a good idea to buy a home as a graduate student? When he began his PhD program, Jonathan had in mind that he would want to buy a home. He thought between his first and second year would be the ideal time to buy. At this point in his PhD, he would know if he would be staying there for five or six years. Emily mentions that it’s a good idea to learn about the neighborhoods before buying a house. Jonathan agrees that it was a good idea to get to know the city and neighborhoods. He shares that if he had bought a home when he first moved to New Haven, he would have chosen a less convenient or less desirable neighborhood. Further reading: Should I Buy a Home During Grad School? 5:11 Was your interest in buying a home specific to New Haven or anywhere you moved to for your PhD? The idea of buying a home occurred to Jonathan when he was interviewing at Johns Hopkins. He saw that homes were affordable near Johns Hopkins. He realized that homes could be affordable even on a graduate stipend. When he chose to attend Yale, he did some housing market research on New Haven and saw he could afford homes there. When Jonathan was interviewing for PhD positions, he met a current graduate student at Johns Hopkins who owned their house. He didn’t meet any graduate student at Yale who bought a home. Jonathan says owning a home as a graduate student is not that common in New Haven. Emily shares that when she was a PhD student at Duke University, it was fairly common for grad students to own home. 7:20 How did you prepare your finances in the months leading up to buying a home? Jonathan worked on improving his credit. He says that good credit is definitely important. To get a mortgage at a decent rate, or even to get a mortgage at all, he had to have good credit. Jonathan also searched for incentive programs around New Haven. He says he saved about $10,000 with incentive programs. He shares that while Yale University offered incentive programs for employees, he could not qualify for them as a PhD student. He relied on incentive programs instead of savings because he was paying expensive rent in New Haven. To research incentive programs, Jonathan talked to a real estate agent who pointed him to incentive programs. Shortly after Jonathan arrived in New Haven, he started working with an agent. Jonathan didn’t have connections to an agent when he started to process. He simply dropped into a real estate office and met an agent there. 9:54 What were the steps you went through to buy a home? Jonathan started looking for houses with agents about three months after he moved to New Haven. He didn’t start seriously looking until six months after his move. He says that even if you don’t have intention to buy right away, it is important to familiarize yourself with the neighborhoods. He was looking at four different neighborhoods around Yale University. He got an idea of price range for homes and who are the neighbors. This process gave him a firm idea of whether he wanted to rent or buy. Most of the time, he looked at houses through private showings with his agent. He went to just a few open houses without his agent. During Christmas break, Jonathan thought carefully about whether he should pursue buying a home or not. He talked to his friends and family, and it seemed like the right thing to do. He asked his family if they could help with his downpayent, and made sure to have open communication with his family. Buying a home took at least two months of seriously looking. Jonathan went through some experiences of making an offer but not getting the hoouse. He recalls three homes that he made an offer for, and there were some other situations where he almost made an offer. He didn’t want to settle for a house that he wasn’t satisfied with. However, his offers were outbid or made too late, and this added to the challenge of buying a home. Emily shares that in Seattle, she hears stories about bidding wars and people struggling to get the house they want, then they end up settling for a home that wasn’t all that they wanted. 13:54 How did you balance the process of buying a home with your first year of graduate work? After his offers on homes were rejected multiple times, Jonathan felt demoralized. He had lowered his standards for a home. But then when he was browsing an online resource, he found a house that looked perfect. This house ended up being the one he bought. 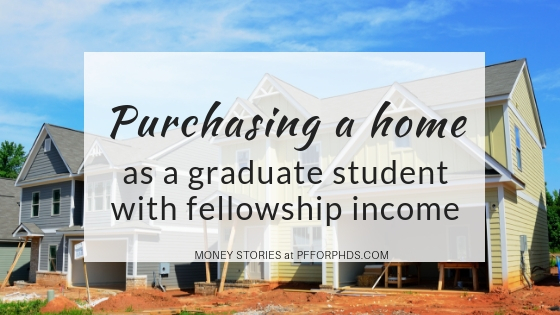 He says it was challenging to balance his graduate work with buying a home, but he was glad he did this in his first year rather than in his second year. He shares the example that on the day that he gave his offer, he was giving a presentation on a paper. He barely read the paper because he was so tired, but he still managed to give a compelling presentation. Right after he finished the presentation, he ran off to give an offer on the house. Much of the stressful part of home buying is waiting to get a response on the offer. 16:01 Tell us about the house that you ultimately purchased and live in now. Jonathan was browsing online on the day before his presentation. He noticed the house was ten minutes away from where he was living. The house had just gone on the market that day. He pushed his agent to get a showing the very next morning. He got to meet the owner and exchanged contact information directly. The owner was a Masters student, and they had a connection. About two hours after the tour of the house, Jonathan gave an offer of $2,000 over the asking price. This was right after his presentation. He asked to receive a response in one day. The next day, someone else made an offer of $5,000 over the asking price with full cash. Jonathan raised the offer to $2,000 over the other offer. Jonathan’s offer was accepted, and he says that meeting the owner in person helped him get the house. 19:06 How was the process of getting a mortgage? Jonathan didn’t have his mortgage ready until after his offer was accepted. He did have a pre-approval, but this didn’t work out for him. 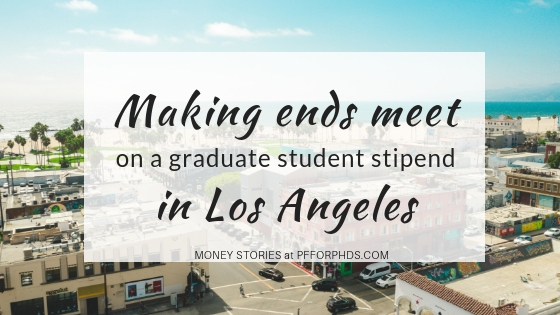 The lenders didn’t understand his financial situation as a graduate student with a stipend. The pre-approval came from a lender with connections to multiple banks. When you make an offer on a house, it is important for the seller to know that you can afford the house. For a pre-approval, the lender does a very brief credit check on you. The pre-approval shows that you can take out a loan of a certain amount. The pre-approval shows the seller that you can take out a loan for the house. Pre-approvals are very superficial, since they do not ask for a W-2. The lender asks for monthly income and proof that you reliably pay rent. After his offer was accepted, Jonathan first explored incentive programs. He found an incentive program that stipulated if he stayed at least five years in New Haven, the program would pay at least $2,000 per year and contribute to the downpayment. The application for the incentive program took a while. Jonathan says that ideally the application should be done before submitting an offer. The seller wanted to move out three months after the sale, so this gave Jonathan the right amount of time to sort out the finances. Jonathan qualified for two incentive programs, but he was happy to get just one because the programs were slow to respond. The incentive programs have a list of lenders that you have to use for a loan. The lenders were local banks in Connecticut. Everything seemed like it would work. He submitted all his documents, but about three weeks before closing, he got a phone call saying that they couldn’t pre-approve of his mortgage because the university wouldn’t be able to provide W-2. The university wouldn’t submit a form indicating that his stipend is guaranteed for 3 or 4 years. Emily explains that there are different types of pay for graduate students. The W-2 is provided for assistantships and this represents a more typical employment situation. Jonathan says he doesn’t know the name of his pay. He gets the 1098-T, and he simply calls his pay a graduate stipend. Emily says that the 1098-T usually means you are funded through an award or outside fellowship. Lenders get confused by fellowship income. Jonathan says his acceptance letter from Yale says his stipend is guaranteed for several years, but the lender wanted the university to sign a form. The university was unwilling to compromise on signing that form that indicated the stipend is guaranteed. Emily says this “guarantee” of income is strange, because even with a W-2, the typical job is not guaranteed for multiple years. 28:15 How did you resolve the problems with the lender? Jonathan was calling Yale’s financial office daily. He asked for help from the Dean. He started looking at the other banks on the incentive program’s list, because he had a feeling it wouldn’t work with this bank. There were a few banks around the university, so he went in person to the bank. He talked to a mortgage broker in person. They sat down together, and Jonathan filled out the form during the meeting with the mortgage broker at the new bank near the university. Jonathan resolved the situation because he found someone who was willing to work with him through his unique financial situation. Jonathan said that this bank offered their own portfolio mortgage with their own requirements. It was harder to qualify for, but it came with a lower interest rates. He had little debt and good credit so he could qualify. It was a different type of mortgage than the first lender offered. Jonathan was really caught of guard by the phone call from the first lender. It seemed fine, then suddenly he got the call, with no easy way to resolve the issue. Closing got delayed from Friday to Monday, but the closing went very smoothly with the new lender. 32:29 How does it feel to be a homeowner and to be a graduate student? Jonathan says it feels good to come back to his own house. He can rent out some of the rooms. If he rents out two bedrooms of the three bedroom house, he can cover a good chunk of monthly mortgage. He says this is a great financial decision for him. The mortgage is less than what he paid in rent, plus he has the potential to rent out rooms. Two months after he moved in, he started renting out the rooms. He has two tenants and they are covering good fraction of mortgage payment. Jonathan has to stay in the house for at least five years. He says that in five years, he will definitely be in a better financial situation from buying instead of renting. He bought in a very good location, in the up and coming neighborhood near Yale. He thinks the market value of the home will increase. 35:25 Have you thought about what you will do when you finish your program? Jonathan says he has two different options after he finishes his PhD. First, if there’s a good market value to sell the home, he can sell it. Second, the location near Yale University will make it very easy to continue to rent the rooms in the house. He doesn’t see himself working in New Haven after his PhD unless it’s for an academic position. Jonathan shares that he had a huge budget for his move, but he didn’t spend very much. He estimates he spent less than $1,000 to move into the house. He moved during the summer, so everyone was getting rid of furniture for free. He used his Toyota Corolla to pick up furniture, and hardly spent any money to furnish the house. He is replacing pieces over time as he saves money. He recommends overestimating expenses for a move. 38:44 BONUS INTERVIEW with Sam Hogan, mortgage industry professional. Emily chats with her brother, Sam Hogan, who works in the mortgage industry. She asks him about solutions for graduate students and postdocs who are receiving fellowship income but want to buy a house. Sam Hogan is based out of Northern Virginia. He works for PrimeLending and he is licensed in all 50 states. He explains what lenders look for in the risk profile. They are looking for the ability to repay, and to see verification of history of the type of employment as well as the likelihood of employment to continue. Sam says that ten years ago, anyone could get a no document loan. This meant anyone could verbally verify their finances, but this practice led to many foreclosures. Now, lenders require written verification of employment. Sam explains that in Jonathan’s case, the lenders sent a form for verification of employment to the university. On the form, there is a tiny check box that asks if employment is likely to continue. It is a yes/no checkbox. Universities won’t check this box because technically a PhD candidate could discontinue their PhD by going into the workforce or transferring institutions. Sam shares that the best approach is to document likelihood of continuation of income. This may be in the fellowship offer letter. Conventional loans look for at least three years of guaranteed income. When it comes to approving loans, it is all about the presentation of the buyer. Sam says to work with someone goal-oriented like yourself, who will be able to over-document your income. For example, you can write a letter about why you got the fellowship, and include that even after your PhD you will have income. This approach ensures you have good presentation to the underwriter. Loan approval comes down to one person’s decision, a human’s opinion. He says to work with underwriters who are flexible and will give you personalized attention. Emily recommends that PhD students and postdocs work with Sam because he understands fellowship income situations. Sam can be contacted by cell phone at 540-478-5803. He can be emailed at samhogan03@gmail.com. His national licensing number is 1491786. He has a Zillow profile under Sam Hogan. In this episode, Emily interviews Christina Padilla, a PhD candidate at Georgetown University in human development and public policy earning $38,000 per year. Christina shares her top five expenses as a DC resident: rent, groceries, eating and drinking out, regular monthly expenses (i.e., phone, internet), and the copay for her therapist. They discuss Christina’s tips on leveling up her housing, meal planning, living car-free, and finding frugal fun in the city. 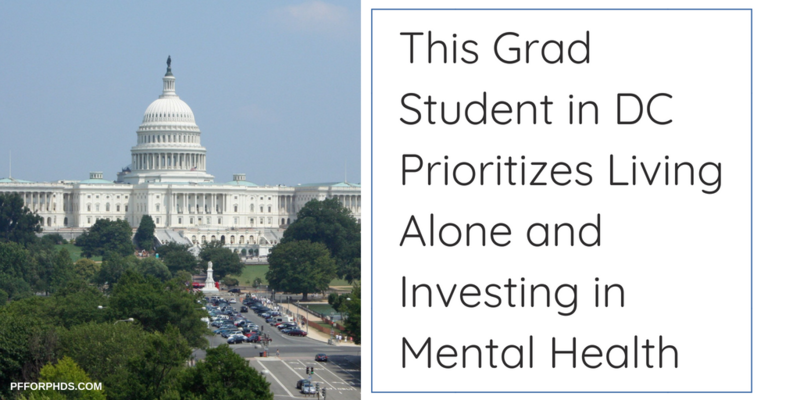 Christina Padilla is a PhD candidate at Georgetown University in Washington, D.C. She is in the psychology department, and specifically in the human development and public policy program. Her research focuses on early childhood, parenting, and early education. Christina completed her undergraduate studies in Baltimore before taking a 2-year research position at the National Institute of Health (NIH) in the D.C. area, and then stayed for graduate school. 3:11 Q2: What are the top expenses that you have, either in a typical month or in the last month? Christina’s top five expenses per month are rent, groceries, eating and drinking out, other regularly occurring monthly expenses like phone and internet access, and a copay for therapy, which she started in the fall. Her first year at the NIH, Christina lived in Maryland because it was closer to her lab and her rent was only $600-$700 plus utilities, but she hated being so far outside the city. In her second year at the NIH, she moved to a group house and paid $800 a month. However, it was a very old house and required Christina to have four roommates. She lived there for three years, including her first two years of graduate school, and then decided it was worth it to live by herself. She had saved money to be able to live in a studio. Now, Christina is budgeting with an income of $38,000 for the fall 2017 through the summer; after that, her funding situation is uncertain. She allocates $2,700 per month, and of that, rent is $1,350. For a place in D.C., that is not very expensive. Christina lives alone in a rent-controlled studio apartment in a very desirable area outside of Dupont Circle. Transportation was once one of Christina’s top expenses, and she would spend $150 a month to get to and from campus. She does not own a car: all the costs were for public transportation. At present, she is able to walk to campus, and now spends about $40 every other month on Metro costs. Georgetown also has a free shuttle between the area she lives and the university campus. 9:13 Is the building that you’re living in popular with students? Another graduate student living in the building recommended it to Christina when she moved out, but Christina took a different unit because the cost was significantly less due to rent control factors. A number of other Georgetown students do live in the building; there are quite a lot of young people and quite a lot of long-term residents, but very few people in between. Christina spends about $200 per month on groceries on average. Unless she is going to a social event, she tries to cook all of her meals at home instead of ordering out. Christina has a small kitchen, which it is in a separate room from the rest of the apartment. She does not have a dishwasher or garbage disposal, but all other major appliances are included. 13:11 Have you always tried to cook at home, or is that something you decided to do along the way? Cooking dinner at home is a habit Christina has always had; eating out was only for special occasions, rather than a casual habit. Even when she was at the NIH, she would cook every day. Her savings enabled her to take a lengthy trip to Europe before starting graduate school—Christina and another woman compared their spending and found that a major factor in Christina’s savings for the trip was that she was not ordering out, and the other woman was ordering food almost every day. 16:17 Do you have any comments on how you keep food costs down in a high cost of living area? Christina also allocates $200 per month for eating out, but her ability to stay within both budgets was enhanced when she started meal planning. Planning meals for a week and only buying what’s necessary for that week has helped her stay within her budget. Christina enjoys cooking, and so cooking food and freezing it is both relaxing and budget-friendly. On Sundays, Christina will make breakfast and lunch for at least Monday through Wednesday, and cook again on Wednesdays. Previously, she would try to prepare meals one day ahead of time but would often find that she was too tired or busy to do so, and ended up having to cook in the morning or buy meals. By planning meals ahead and cooking in bulk, Christina saves herself money and time. Christina sometimes feels that $200 per month for eating and drinking out may be high, but acknowledges that D.C. is an expensive city to eat in—one brunch could cost $50 or $60. Brunch and happy hours are both popular in the city, and the costs of each can add up. The $200 also includes going out for celebrations and other social events. Christina avoids going out to eat unless it is with other people so that it stays a treat instead of becoming an expensive habit. Other regular monthly expenses make up the fourth largest category for Christina, which amount to about $100 per month. She pays $35 each month for her phone, $43 for internet access, $13 for dental insurance, and $5 for Spotify, which is cheaper with a student membership. The cell phone price is for the cost of the actual phone; the one thing Christina’s parents still pay for is Verizon service. In the fall, Christina was having a difficult time with her dissertation. The $200 per month she now spends on co-pays were originally going into savings and have transitioned into payment for counseling. Christina mentions that all graduate students need support but sometimes struggle with talking about it or feeling justified in seeking out help, and enjoys talking about counseling to help de-stigmatize it. She considers it an investment in herself and getting through graduate school in one piece. 23:24 Will you be finishing grad school soon? Christina has an external fellowship for $30,000 for two years, and her department gave her an extra $8,000 to match everyone else’s stipends. She will continue to receive the $30,000 stipend but does not know whether her department will award the $8,000 again. She hopes to finish in January of 2019. She may drop her counseling sessions to once or twice a month instead of each week. 25:33 Q3: What financial goals are you working on? In addition to the five categories and other spending, Christina saves at least $200 per month. $100 goes into a mutual fund with Schwab and $100 goes into a Roth IRA that she set up last year. Christina does not get a very good interest rate on her savings account and chose to invest in a mutual fund because of an episode of the John Oliver Show “Last Week Tonight,” from which she learned it would be a good option for her savings goals. She has not decided whether to use it for a mid-life expense or for long-term savings, such as a down payment on a house or for retirement. 28:03 Q4: What don’t you spend that much money on that might surprise people? People are often surprised by how little Christina goes out to eat. Many people in graduate school tend to order in a lot for convenience. However, many people bring lunch to campus, so Christina regularly eats lunch with other people in her lab, and bringing food has not been an isolating experience. 29:24 Q5: What are you happy with in your current spending and what would you like to change? Christina is overall happy that she is staying afloat and able to save money even though she lives in an expensive city. Many of her friends have “real” jobs where they make more money, and it is hard to compare herself to them, but she is pleased with being able to save at all. She tries to think positively about being paid to get a degree and be happy that a stipend is available, that tuition is covered, and that she has no student loan debt. 31:43 What advice would you have for someone who is starting in their first year at Georgetown? Christina’s number one piece of advice is to be honest and reflective with yourself about your priorities in terms of housing. It’s not always possible to live in a luxury building in a great location without roommates and have low rent. There are housing options for all priorities, but you have to be honest about what you want and to be ready to make sacrifices in terms of money, location, or roommates. A lot of people live outside D.C. in Virginia or in Maryland, but many of those areas have become as expensive as D.C., so comparing prices is important. Georgetown does not offer much graduate student housing, and what’s available is about equally expensive as other housing options if not more. Georgetown does provide shuttles, however, because the campus is not connected to the Metro line. 35:30 Any closing thoughts or other comments about living in D.C. on $38,000 per year? D.C. has a lot of free activities, especially in the summer. There are many free outdoor concerts, and all of the D.C. museums and monuments are free to visit. No matter where you live, setting a budget and sticking to it is immensely helpful. Christina uses the free version an app called Good Budget, which allows you to create spending categories and record your transactions. The app will show a green bar decreasing as you spend throughout the month. Christina found that Mint was not helpful for her in curbing her spending and now uses Good Budget instead. Trying to keep up with people who have “real” jobs and salaries is impossible, but it is possible to politely take charge of social situations. For example, Christina recommends offering to choose the restaurant where friends will gather and selecting a lower-cost option. Other people may not recognize that their budget constraints might be looser than a graduate student’s. Christina opts for casually steering events with friends towards more affordable activities, and will occasionally decline to go to things if they are too expensive. She has found that most people are fairly sensitive to graduate student budgets and have no problem with less expensive activities and options. 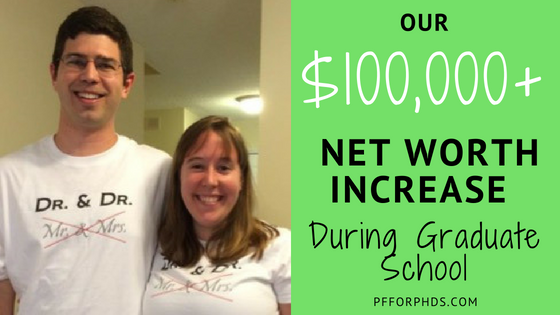 I share my personal money story, which is how my husband and I increased our net worth by over $100,000 while we were in graduate school. We carefully budgeted our two PhD student stipends to consistently add money to our investments and pay for both our regular monthly expenses and irregular expenses such as travel. Over our seven years as graduate students, we accumulated approximately $75,000 in retirement savings, $20,000 in cash, and enough money to pay off my student loans plus an additional $5,000. I detail the five strategies we used that made the largest positive impact on our cash flow, which enabled us to increase our savings percentage over time. Would you like to be a guest on season 2 of the podcast? Please fill out this survey! When we graduated from Harvey Mudd College, I had $17k in student loan debt and no savings, and Kyle had zero student loan debt and approximately $5,000 in savings. Kyle went straight into a PhD program at Duke University in Computational Biology and Bioinformatics. I spent one year in the National Institutes of Health’s postbac program before starting a PhD program at Duke University in Biomedical Engineering. Our $100k+ increase in combined net worth occurred between 2007 and 2014 when we earned two graduate student stipends. My NIH stipend was $24k/year, and my Duke stipend went from $24k/year when I started to $28k/year when I finished. Kyle’s Duke stipend went from $25k/year when he started to $29k/year when he finished. In the first three years, Kyle and I were dating and kept separate finances. We got married in 2010, so for the last four years of the seven-year period we kept joint finances. Saving and investing consistently throughout the whole period. Budgeting intensively to keep a lid on expenses and funnel more money into savings. Investment growth due to the bull stock market that started in 2009. Our programs paid us above the local living wage, and Durham, NC is also a medium cost-of-living city. We identified our values, which included financial security and family/community. This meant that saving, including for retirement, was a top priority, as well as travel to visit family and friends. We reduced our spending on everyday expenses so that we could funnel more money to our top priorities. We employed percentage-based budgeting. Right off the top, we paid our taxes, tithed (10% of gross income to our church), and saved for retirement and near-term expenses. Any extra income we received, such as gifts, side income, and credit card rewards, went toward our financial goals instead of general spending. I started saving 10% of my gross income into my Roth IRA as soon as I started receiving a stipend and maintained that savings rate for 3 years. Kyle didn’t intentionally start saving right away, but allowed money to build up in his checking account. In 2009, he opened and maxed out a Roth IRA in 2009, and maxed out a Roth IRA every year following. Once we got married, we made a game of trying to max out two Roth IRAs each year. We never quite achieved our goal, but we did increase our savings rate from 10 to 17%. What exactly we were invested in doesn’t matter as much as our savings rate, though I am happy to share my investment choice. Sign up for the mailing list to receive a 700-word letter on which brokerage firm I use for my Roth IRA and what it's invested in. Initially, I didn’t focus on cash savings. In 2007, I paid off a $1k unsubsidized student loan. When I started grad school, I bought a car with a $3,500 car loan. Later that fall, my parents gave me $10,000, which I used as a general savings account/emergency fund. I paid off my car loan, then repaid my “car payment” to myself to rebuild my savings. Kyle naturally lived below his means, and he continued to accumulate savings in his checking account. The year we got married, 2010, was a financial reset point. From our cash savings, we paid approximately $10k in wedding expenses. When we joined finances, we assessed our combined balance sheet. We each had money in our IRAs, and we also had $17k in cash. We set $16k aside to pay off my student loan balance and set up a $1k emergency fund. However, that left us with no savings for near-term expenses, just whatever we could cash flow. We built up $20k in savings between 2010 and 2014 using targeted savings accounts. We were inspired to start using targeted savings accounts by several large irregular expenses that hit right around the same time and were difficult to cash flow: an expensive wedding season, two university parking permits, and season tickets to the Duke men’s basketball games and Broadway theater series. We decided to start preparing in advance for anticipated expenses over the next year. We started out with savings accounts for Cars, Entertainment, Travel. We set up budget for each account by anticipating when we would need or want to spend money and calculating a savings rate. Targeted savings accounts turn large, irregular expenses into small, fixed expenses that are easy to write into a budget. By 2014, we had more savings accounts: Travel, Cars, Entertainment, Appearance, Electronics, Medical, Charitable Giving, CSA, Taxes, and Camera in addition to our checking and emergency fund accounts. We used Ally Bank, which did not charge us any fees or require minimum balances, etc. We set up automatic savings rates into the targeted savings accounts, then manually pulled money back for each expense when it occurred. We built up the savings in these accounts because we over-estimated what we would need in various areas, which caused us to over-save. The one-page worksheet guides you in brainstorming and categorizing your irregular expenses, including three questions to ask yourself and a list of common irregular expense categories. By 2010, we had the money to pay off $16k in student loans. Instead of paying it off, we chose to conservatively invest they money to earn a small return. It was difficult to choose how to invest the mid-term money, and we wanted to be conservative so as not to lose it. We decided to conduct an experiment on ourselves to find out what kind of investors we were. In 2011, we put a large fraction of the money in a CD, a small fraction in aggressive stock mutual funds, and a large fraction in conservative mutual funds (stocks and bonds). We learned that we are committed to passive investing. Why Pay Down Your Student Loans in Grad School? I started blogging at Evolving Personal Finance in 2011; learned a ton from my fellow personal finance bloggers and developed my own ideas about how I should manage my money. I published a post near the end of grad school on the best things we did to increase our available cash flow for saving and investing. This list largely explains how we increased our retirement savings rate from 10% to 17% savings and built up $20k in cash savings. 25:24 1. Moved to decrease rent twice (savings $2,340/year). Initially, we lived in a great apartment, but one year the rent jumped up so we moved to a townhouse, decreasing our rent by $110/mo (what it would have increased to over the new rent). The next year, we moved again and decreased our rent by an additional $25/mo (previous year’s rent to new rent). Through those two moves, we maintained our home size (1,200 sq. ft., 2 BR, 2+ BA). With the latter two townhouses, we actually reduced our commute to Duke, so the saving was even deeper than just the rent decrease. We did give up some amenities we had through the apartment complex, but that was acceptable. How Much of Your Stipend Should You Spend on Rent? We cancelled our cable TV in favor of paying for internet only. We bought an antenna so we could still watch broadcast TV. We signed up for cash back rewards credit cards, both for good ongoing rewards and good sign-up bonuses. We looked for minimum spends that we could actually meet and timed application so that we could put our large irregular expenses on the new cards to help meet the minimum spend. After we got married, we started commuting to Duke together. Around that time, my car needed some expensive repairs, so we stopped using it. Our reduced expenses came from lower car insurance, dropping one parking permit, less gas used, half as much maintenance required, and less need to keep money on hand for repairs. We had to work out our schedules to be able to share the car and ended up spending a lot more time together, which was wonderful! The best thing about these pain-free money-saving moves is that they don’t require any ongoing effort/willpower. Typically, we just had to carry out one-time decisions. I had been blogging about personal finance for 3.5 years by the time finished grad school, and I also volunteered with Personal Finance @ Duke. After I defended, I decided to give my own seminar on personal finance for graduate students. I had the best time making and delivering the seminar and answering questions from my peers. I asked myself, how can I teach my peers about personal finance as my job? The initial phase of my business was as public speaker; I gave seminars at universities all over the country. That first seminar I created is now titled “The Graduate Student’s Guide to Personal Finance,” and I have others on taxes, investing, budgeting, and starting grad school on the right financial foot. If you’d like to (figure out how to) bring me to your university for a seminar or workshop, please email me at emily at PFforPhDs.com. In addition to speaking, I’ve added other aspects of my business, ebooks and online courses. I have two new initiatives launching later this year, an investing webinar series and a membership community. A version of this article first appeared on GradHacker. There are a few different versions of the “rule of thumb” regarding how much of your income to spend on housing. No more than 25-30% of your take-home pay seems to be the consensus, with a few outliers. But as a graduate student receiving a stipend, does this guideline apply to you? How should you figure out how much to spend on housing? Clearly, whether your university is in a high cost-of-living or a low cost-of-living area will have an enormous impact on how much you need to spend. For some graduate students, this rule of thumb is unfortunately useless and discouraging. In certain high cost-of-living areas, rent can be 50% or more of a stipend. But even in pricey markets, it’s worthwhile to take a hard look at yourself and your surroundings to make the best choice you can among your limited options. But, other graduate students are in an area that offers them a degree of choice in how much of their stipend to spend on rent. They have the opportunity to evaluate the range of reasonable choices and decide what is best for them, given their values and other financial goals. Whether you are moving to a new city to start grad school or are several years into your program already, you should evaluate your housing costs to make sure you are spending the right amount of money and getting the right amount of value for you. To do so, you have to evaluate both yourself and your environment and, ultimately, balance your budget. Since housing is the biggest component of most Americans’ budgets, you should use a mini-financial planning process to help you determine where housing falls on your priorities list. Start by determining your top life values (family, freedom, creativity, health, achievement, etc.). Then, set goals for your finances that help you fulfill those values. Once that high-level picture starts to come into focus, you can figure out where housing falls on your priorities list. What aspects of housing—space, location, safety, privacy, amenities—help you fulfill your values or are otherwise very important to you? What attributes are non-negotiable and what are you willing to let go of in favor of a lower price? This process can bring a lot of clarity because it helps you directly compare differences in the price of housing with your other financial goals. One of the first and biggest decisions you will make is whether or not to have a roommate/housemate. Some graduate students are so tired of living with other people that they won’t consider it no matter how much cheaper it would be, while others may be excited about how a roommate would benefit their lives as well as bottom lines. If you’re on the fence, price out both options and ask yourself if having $X more per month to put toward other areas of your finances is worth the (reasonable) potential downsides such as noise/distractions, differing standards for common areas, reduced privacy, or personality clash. Living with another grad student in your same year or area of study who understands the demands of your program could be a great option. Your best resource for finding appropriate housing options is other graduate students. I have found that grad students are quite willing to divulge what they pay in rent, and widely polling can give you a great idea of the market. If you haven’t yet moved to your city, start by emailing students you met during your visit weekend, students in your (prospective) lab/group, or students in departmental leadership positions. But you don’t have to keep thinking “inside the box,” either, if it seems that grad students flock to the few most popular options. Where in your city do other young professionals or people with an income similar to yours live? In addition to asking around, check your university’s website to see 1) if housing is offered to graduate students (and at what price and priority) and 2) if your university makes off-campus housing recommendations or maintains a housing database of its own. Searching on Craigslist is usually a good way to find housing and/or roommates, and you can also check listings on Trulia, PadMapper, apartments.com, etc. Which database is best to use to search for housing will vary somewhat by city. Be sure to consider various types of housing. In Durham’s housing market, my observation is that the least expensive option is renting (or buying) a single-family home with several other people and the most expensive option is renting a luxury apartment near campus. In some cities, on-campus housing may be the least expensive option, and by talking with your peers you may discover the best practices for getting your foot in the door. Ultimately, when reconciling your own priorities with the realities of the housing market, your expenses need to be less than your income. If you are simply locked into high housing costs no matter how low a priority it is for you, the rest of your budget is going to be affected. But one additional factor to consider is how housing cost might play against other needs like transportation and utilities costs. Perhaps a higher base housing cost can become more palatable if it means you can live car-free or have low utility bills. For example, are you able to keep your total needs spending to 50% of your net income (recommended in All Your Worth), or at least minimize the whole category? If you live in a city where you have good housing options across a reasonable range of prices, this is the situation where the rule of thumb might come in handy. Calculate what 25-30% of your household take-home pay is and look at what that will get you. If you are tempted to spend more than 30% of your income on housing and don’t have to, ask yourself if it’s really that important and if you are going to be able to meet your other financial goals. Certainly, you can spend less than 25% if you are so inclined! If you are renting, you aren’t locked into the housing decision you made at the start of grad school. In fact, you’re likely to make a better decision about housing after you have gotten to know your city and have seen where other grad students live. Your priorities and income may also change with time. It is valuable to periodically re-run this analysis on yourself and your environment to determine if moving is warranted. I have personally benefitted from re-evaluating the cost of my housing during graduate school. My husband lived in the same apartment for his first five years of grad school and really loved it. But the city changed during those five years, and the area he was renting in no longer seemed like the only option. When the apartment complex tried to raise our rent 6% year-over-year (the rent increases in the previous 5 years had summed to about 10%), we took it as an opportunity to shop around. We ended up moving to a townhouse with the same square footage closer to our university (reducing our commuting costs) for an 11% decrease in rent. The only downgrade was that our new community didn’t have a clubhouse gym, but that wasn’t much of a sacrifice, as we had access to our university’s gym. I count that move as one of the best financial decisions we made to reduce our spending during grad school. For your stipend, is housing in your city expensive, reasonable, or inexpensive? Where does housing fall on your priorities list? Have you been able to find a good deal in your city? The largest line item in nearly every graduate student’s budget is housing. Whether you own your home or rent, whether you live on campus or off, whether you live in an apartment/condo, townhouse, or single family home, unless someone is subsidizing it, you are almost certainly spending the biggest chunk of your income on your abode. If your rent is $400 per month and you spend five years pursuing your PhD, over the course of your studies you will spend $24,000 on rent. If your rent is $1,000 per month and you spend six years pursuing your PhD, you will spend $72,000. These are staggering numbers, especially when you compare them to your annual stipend. Your decision of where and with whom to live is almost certainly the most financially impactful budget decision you will make during graduate school. Housing is a very tricky expense category to budget. There is no argument that you need somewhere to lay your head. A certain fraction of your housing spending is simply a baseline that covers a necessity. (That is, unless you can get really creative, such as by living in a van.) But you can’t write off your entire housing expense as a “need,” especially if you then let yourself off the hook from evaluating its cost carefully. A fraction of your housing spending is “want” as well. Perhaps you are paying a bit more for a desirable location, an amenity, extra square footage, updated features, a parking spot, or solitude. There’s nothing wrong with wanting to upgrade from a Spartan home, but you must be honest with yourself about what aspects of your housing you could dispense with if push came to shove. What makes housing even more special in terms of your budget is that it is a fixed expense. Once you settle on where you’ll live, your housing costs are locked in for the term of your contract. It’s difficult to change your housing costs because that involves moving or adding/subtracting a roommate. That means that you can lock in a high rate – or a low rate. Fixed expenses represent excellent opportunities for cost reduction. If you are looking for a simple, long-lasting way to reduce your spending, target a fixed expense. You have to make the decision to reduce it and put in the effort one time to carry out your decision, but after that you have the lower rate set every single month in perpetuity. And what better fixed expense to target for reduction than your largest one, housing? The most remarkable aspect of your housing decision is that you typically have to make its first iteration before matriculating into your graduate program. If you are moving to a new city, you have to search for and secure your housing with next to no knowledge of the rental market, possibly sight unseen or after one scouting trip. Therefore, your first dwelling in graduate school may not be the most optimal for you financially. Although you should ask for advice from older graduate students when you make that initial housing decision, nothing is as informative as actually living in your city for a few months or a year. If you haven’t yet moved once within your grad school city, take the opportunity right now to re-evaluate your current living situation. You likely have a totally new perspective on the decision compared to the last time you made it. Even if you have moved once with an intimate knowledge of the local housing market, your financial goals and budget evolve with time; perhaps you are different now and you require a new housing arrangement. It takes some patience and commitment to decide to move and then wait several months to follow through, but a significant enough reduction in housing expense makes the process worthwhile. Have you re-evaluated your housing costs since you moved to graduate school? If you were able to reduce your spending on housing, what would you do with your extra cash flow?